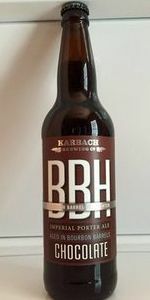 Bourbon Barrel Aged Hellfighter (w/Chocolate) | Karbach Brewing Co. Pours a pitch black color with a thin foamy head that quickly dissipates. Lacing is mild. Strong chocolate aroma with roasted malts. The roastiness is a little stronger on the taste with sweet chocolate and a mild peppery taste at the end. Medium bodied with moderate carbonation. No date spied on this bottle. A: Black pour with a mid-sized fizzy light brown head. Head fades pretty quickly. No real sign of lacing either. S: Strong sweet chocolate with a bourbon backing. Lots of dark fruits and a hint of char. Sharp booziness. T: Big smooth bourbon with a sweet milk chocolate overlay. Lots of caramel and oaky vanilla. Spicy alcohol in the finish and lingering in the aftertaste. QUITE a boozy taste and feel. M: Thinner than I was expecting for 12.5% Smooth and silky, however. Quite a decent burn to boot. O: Serious bourbon barrel effect on this one. It's big, boozy and stinging from start to finish. Belly-warming as well. It's not harsh, it's just boozy. The chocolate is a nice addition up front, really sweetens it up a bit there. Bourbon Barrel Aged Hellfighter (w/Chocolate) from Karbach Brewing Co.